As well as giving you total control of your time and in-flight experience, ANOTHER key benefit of flying privately is being able to easily access some of the most remote (and wonderful) places on earth, such as THESE EXOTIC private islandS around the world. Air Partner asked private island specialist The Modern Concierge to arrive at an inspiring list of some of the world’s best private island hideaways. When choosing to get away from it all, a private island offers travelers the most personal luxury: privacy. And clearly, the ultimate way to travel to your private island is by private jet. When Conde Nast Traveller and Travel+Leisure magazine both vote an island #1 in the Caribbean for their Reader Awards, then you know you are on to something very special. Kamalame is a 97-acre private barrier island sitting just off the coast of Andros - the largest and least developed landmass in the Bahamas archipelago. The island offers a unique mix of ‘resort and residences’ which means if you really love it there, then you could buy your very own slice of paradise with private beachfront villas and plots available. The island regularly hosts exclusive all-island wedding and private celebrations, but also individual beachfront resort cottages and owners villas are available throughout the open year (the island closes mid-August to mid-October each year). Kamalame is famous for its graceful approach to stylish island living, with a relaxed and unpretentious atmosphere. As well as having the only over-water-spa in the Bahamas, the coastal waters around the island offer some of the world’s best diving (the Andros Great Barrier Reef is the 3rd largest reef in the world) plus the elite, sustainable sport of Bonefishing is what made the island famous when it first opened. A most private of islands, and one rarely read about. Escape to 80 lush private acres and choose from six beaches where the Atlantic Ocean meets the Caribbean Sea. Up to 50 guests can be cosseted in complete luxury in the islands opulent rooms. Accommodation is within two Balinese and French Colonial inspired residences and three custom designed luxury cottages. At your disposal is a full range of water toys - from a fleet of boats to jet skis and inflatables plus scuba charters to explore beneath the sea. The beach front rotunda offers a dramatic focal point for celebration dinners or parties or perhaps a wedding pavilion? The island is available only for exclusive rentals. Land at Maurice Bishop international airport. When one of the great Sorrento hoteliers also owns a private island just off the Amalfi coast from Positano, you know it must make for quite an exotic choice location indeed. Welcome to Li Galli. The most glamorous of private islands; previously and famously owned by Rudolph Nureyev and with a visitors book including Sophia Loren and Jacqueline Kennedy. It’s that kind of special place - and offering the unique view of Positano from the sea. Li Galli is actually an archipelago of three islands - with mentions in the history books as far back as biblical times and at the centre of the ‘Siren’s or ‘Le Sirenuse’ - the mythical and dangerous creatures of Homer’s Odyssey. The dolphin shaped island is only available for exclusive rental a few weeks of the summer, by special arrangement and accommodates up to 12 guests in six suites, cared for attentively by a team of nine. A boat and private helicopter can be included in the rental arrangement, and at your disposal throughout your stay. Private rentals of Li Galli can be arranged via The Modern Concierge by contacting your Air Partner Account Manager. Making the National Geographic Unique Lodges of the World list, this private island is a natural wonder. The Brando does not disappoint. That, plus the added megastar wattage of this island having been Marlon Brando’s secret hideaway adds further allure to The Brando. Just north of Tahiti, The Brando has to be one of the most exotic private islands in the world and is available for exclusive all island rental as well as individually booked accommodation in 35 stunning private villas. The association with National Geographic Unique Lodges means strong eco-credentials and cultural highlights, plus excellent family-friendly facilities. Best time to visit is between the dry months of May to October, although the island is open year round. Land in Tahiti for the short 20 minute transfer to the island. This could be one for music lovers. Obanjan opens for the summer in the style of a laidback music and cultural festival over the months of July and August, with accommodation in luxury waterfront tents. However, if you are planning a large private or corporate gathering around the end of June or early September, then the island can be available - by very special arrangement - for the exclusive use of your guests, with the food and service tuned to your preferences. Host your own private mini-festival or make it all about wellness and simply enjoy the stunning nature of the Croatian coast and waters. Travel in a Challenger 300 and land in Split, before taking a boat to Obanjan. One of the few, and perhaps the most beautiful of, private islands in Spanish coastal waters, just 900 metres offshore from the east coast of Ibiza. This 148-acre island defines Ibiza luxury and can be rented with its own boat and helicopter. The island accommodates 10 people in 5 luxury suites within the villa in the middle of the island, plus boasts its very own lighthouse. You may not want to leave, but Formentera is just a 30-minute boat ride away. DJ’s can be flown in should you wish to enjoy your own private island party. Land at Ibiza airport and take a boat or helicopter to the island. The Modern Concierge Ibiza services have been featured in FT How To Spend It and Daily Telegraph. Services are available to Air Partner clients by calling your Account Manager. Only Four Seasons offers an entirely private island in the Maldives - in the 5 acre shape of Voavah situated within the Baa Atoll UNESCO World Biosphere Reserve, so you can expect breathtaking nature (above and below the sea) as well as the legendary Four Seasons luxury and hospitality. Sleeping up to 14 adults and 8 children in two villas and suites. This is another island with boat included - a 19 metre motor yacht for sunset dolphin cruises and manta watching. The island also has its own spa and party space. Land in Male, and arrive by seaplane. Perhaps the biggest surprise about this 900-acre island is that it is so close to Athens - 30 minutes by speedboat or 15 by helicopter. Perfect for groups of 8 to 22 people, the location gives the island a very long season weather wise and well within easy reach of the major European cities. The main villa sleeps 8 to 9 guests with additional residences offering further accommodation to the 22 person maximum. This Greek island retreat has been owned by the same family since 1916 and, therefore, is unspoiled by modern development. For those who prefer to take their four-legged friends on private jet holidays, the island welcomes pets. Horse lovers will enjoy the story behind the island horses and ponies - saved from elsewhere by the island owners. Interiors are chic and retrained, giving concentration to the views and island landscape. Fly to Athens in a Citation Jet 2 and get a speedboat or helicopter transfer to the island. 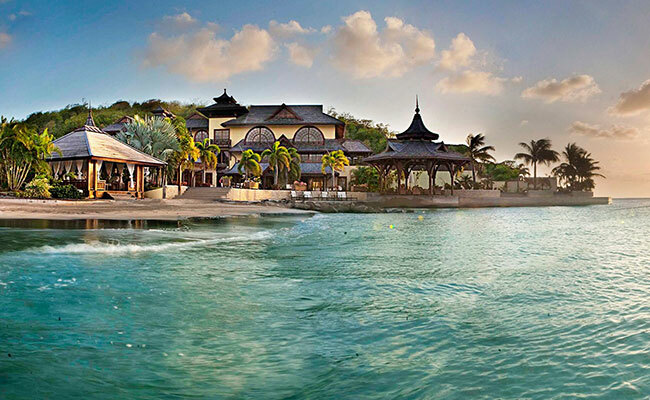 Perhaps the most famous private island in the world with an equally famous owner, Sir Richard Branson. This fantasy island in the British Virgin Islands comes replete with water toys aplenty, freshwater infinity pools and tennis courts. It is also an island which offers suites and villas for individual booking during ‘Celebration Weeks’. This year, during August, September and October with four-, seven-, nine- and ten-night packages still available, you have the opportunity to experience Necker alongside 16 other couples. Bag the Great House Master Suite to rule the roost. Land in Tortola (Beef Island) or Virgin Gorda. Necker Celebration Weeks can be booked with The Modern Concierge by speaking to your Air Partner Account Manager for further information of these special packages.